Change Race without stats decrease. When you change your race through console command "showracemenu" you find most of your stats are with default value again. For example, if your OneHanded was 100, now youve got OneHanded 15. 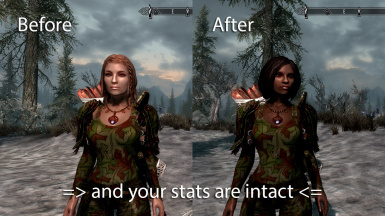 This mod gives you opportunity to change race without any loss. In addition, if you are werewolf, and your race is changed through console, when you tansform to werewolf and back, your apperance may be remain the same, but your race shifted back to preious race, the race which you had when you became werewolf first time. When you activate this mod, on next loadgame you automatically get an ability to call RaceMenu, and edit your appearance without any stats loss. Added: Same fix for vampire lord, as for werewolf.